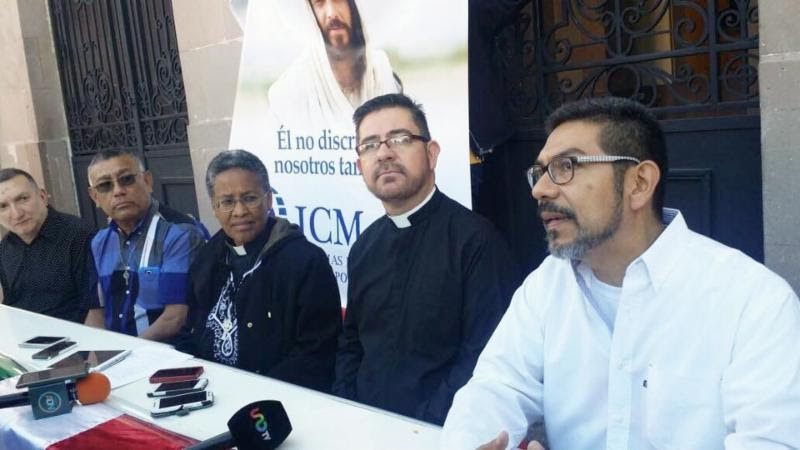 From left: Enrique Zenteno (Libres por Amor ICM, Puebla), John Garcia (ICM Guadalajara), Rev. Elder Margarita Sánchez, Rev. Alejandro González (ICM Casa de Luz, Monterrey) y Walter López (Puentes de Luz ICM, Querétaro). The Universal Fellowship of Metropolitan Community Church in Mexico, R.A.* issued a statement today, 7 September, as a member of the Queretaro’s Alliance for the Right to be Not Discriminated Against and the Separation of Church-State. This public release about Equal Marriage as an inclusive church was announced in the very place where the current Mexican Constitution was debated and signed. The Constitution is the same document that protects all citizens from discrimination within its First Amendment. “Hereby is forbidden any form of discrimination due to ethnic origin or nationality, gender, age, disabled, social and health condition, religion, opinion, sexual preferences, civil status or any other attacking human dignity and pretending to supress or demean the rights and liberties of the people”. This day, The Universal Fellowship of Metropolitan Community Churches sends a message of peace and love to all Mexican nationals. Querétaro is the cradle of the 1917 Constitution, which is the reason why we have gathered here today. We wish to extend a message of peace and love to all Mexican nationals. The Universal Fellowship of Metropolitan Community Churches, R.A.* was introduced to the Mexican territory more than 32 years ago. It is a Christian, inclusive church preaching the unconditional love of God and acknlowledging and honoring the separation of Church-State. 1. We call the leadership of the Roman Catholic Church and Evangelical Churches to respect and honor the separation of Church-State, enabling a full observance of law and officials. Jesus Christ did likewise when he invited his disciples to “give to Caesar what is Caesar’s and to God what is God’s.” Peter speaks in a similar way as he invites us to comply with authorities and raise our prayers for them. 2. To all religious leaders, we ask them to stop the campaign which, from their church’s altars and pulpits, they are performing against the rights of our LGBTI community, anti-Christian, hate and misinformation campaigns, to manipulate people to take action against men and women deemed ‘different’ by them. The message that Jesus Christ left his disciples to be preached is one of love, forgiveness, freedom, and reconciliation aiming for unity among all, and goodwill to men and women. It is any Christian’s duty to love God above all things and our neighbor as ourselves. 3. We ask all Mexican civil laws to be observed, as we must follow and obey them, both as believers and non-believers, respecting the separation Church-State at all times. Mexican laws belong to the public realm, while anything concerning faith belongs to the private, personal space. Any form of discrimination is specifically prohibited in the Mexican Constitution. As clergy and pastors following Jesus Christ’s Gospel, we therefore call you not to bear messages of hate and exclusion which promote division and collapse of family and society. To all Christians, we make a call to avoid clashes between families and siblings. The Universal Fellowship of Metropolitan Community Churches is now in ongoing prayer, asking Jesus Christ to grant us the vision and the fortitude to become agents of unity and harmony during this time in our nation. We ask the Holy Spirit to shed its Grace to all Mexican families regardless of how they are composed. We pray they remain strong together as they fight against discrimination and prejudice, and to remember God’s nature which does not show favoritism, but rather shows God’s infinite Love for all Humankind by having sent his only begotten Son to this world. May God empower every citizen in our country, grant wisdom to its rulers, and allow our nation to prosper in every way so every Mexican citizen may enjoy the very same rights. Dios de Amor MCC Mission, Río Bravo, Tamps.